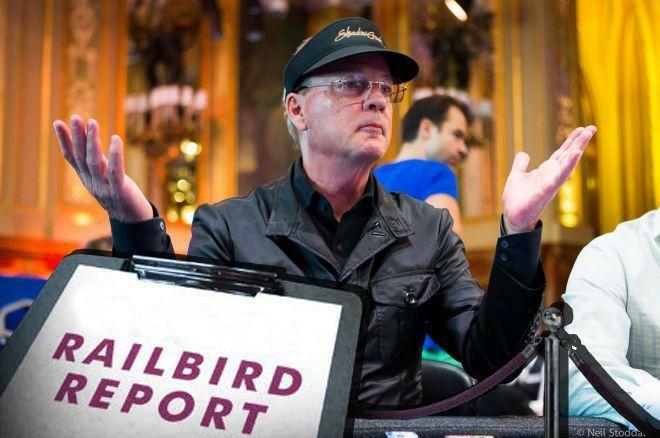 Bobby Baldwin made a name for himself in the poker world after winning four World Series of Poker (WSOP) bracelets including the 1978 WSOP Main Event and playing some of the highest stakes cash games. In more recent times, he's better-known as a casino executive and for the high-stakes poker room named after him called Bobby's Room at the Bellagio. His accomplishments and contributions led for him to be inducted into the Poker Hall of Fame by his peers in 2003. This week, Poker Central released a five-minute documentary titled Stories from the Felt - The Legend of Bobby's Room which included clips from some of the players who have seen first-hand the million dollar swings that take place on a frequent basis at this legendary poker room. Elezra: "I lost in one night 1.37 million." Eli Elezra kicked off the video talking about some of these swings. "I lost in one night 1.37 million," said Elezra. "My parents never made this kind of money for all their life. Then you have the day that I won $1.78 million in eight hours. Then you leave this place, and you think, nobody can touch you, you are the best pro poker player in the world." Nick Schulman attended Bobby's Room for the first time when he was just of legal age at 21-years old. He gives his perspective on the types of players that frequent the room. "It's a very interesting place," said Schulman. "You really have a collection of talented players, degenerate gamblers, chiseled old veterans, and you have new guys. And you have guys like me that are sort of in the middle I guess at this point. But the one thing all of these people have in common is some desire to play stakes like this." Schulman: "The one thing all of these people have in common is some desire to play stakes like this." Later in the video, players including Schulman, Jennifer Harman, Todd Brunson, and tv producer Mori Eskandani talk about how players handle the massive swings that take place with the big action in the poker room. Not all of the players that visit Bobby's Room are poker pros as some just want to play the highest stakes possible and others just want to feel what it's like to play with the pros. Elezra told an anecdote where a rich player holding 17 chips valued at a combined $1.7 million just wanted to play with them since he saw them on television. Check out the video below for an amazing perspective into Bobby's Room. Sign up for PokerGO for more exclusive (mini) documentaries, and live streaming of some of the biggest poker tournaments in the world. While this wasn't the biggest pot of the week, it was the biggest pot of the week awarded to a single player. The hand with the biggest pot, which we'll get into later, involved a side pot. In three-handed play, Mikael "ChaoRen160" Thuritz opened for $440. "Katya_18" three-bet to $1,800 from the small blind before Jordi "prot0" Urlings four-bet to $4,200 from the big blind. Thuritz got out of the way and "Katya_18" five-bet jammed for $20,000. Urlings, who barely had his opponent covered, called. "Katya_18" was an almost 82 percent favorite and the duo decided to run it twice. The first board came . The all diamonds board handed "Katya_18" the first half of the pot with the nut-flush. The second board came and was also unable to improve Urlings' hand. "Katya_18" claimed the entire pot worth $40,440. 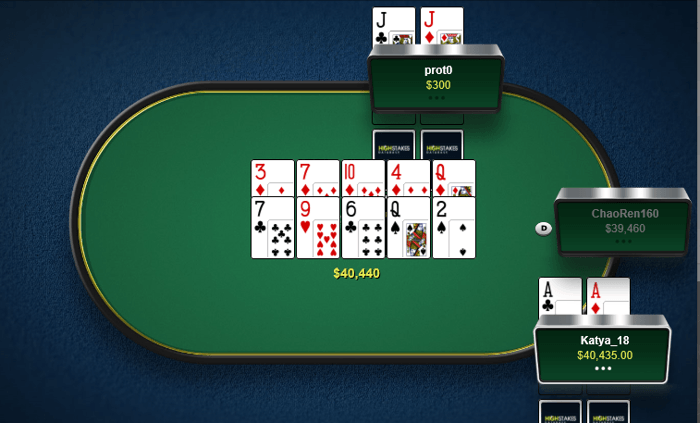 With five players on the table, the action folded to "ActionFreak" on the button who opened for $350. "Grazvis1" three-bet to $1,250 from the small-blind and both "uwintakeit" from the big blind and "ActionFreak" called. "Grazvis1" checked the rainbow flop and "uwintakeit" bet $3,700. "ActionFreak" raised to $14,945 and "Grazvis1" folded before "uwintakeit" jammed for $17,623. "ActionFreak" had his opponent covered and called. The duo decided to run it twice with "uwintakeit" with a 2:1 advantage in the hand heading to the turn. The came on the first turn followed by the on the river to give "uwintakeit" the nut-straight and half the pot. 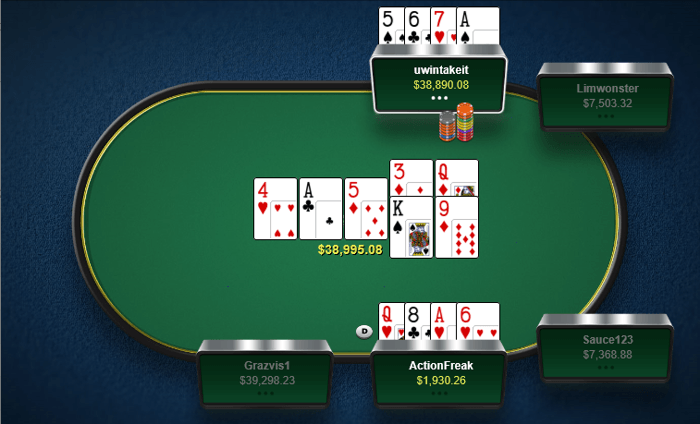 The second board ran out with just blanks for both players after the came on the turn followed by the on the river to give "uwintakeit" a pot worth $38,895. 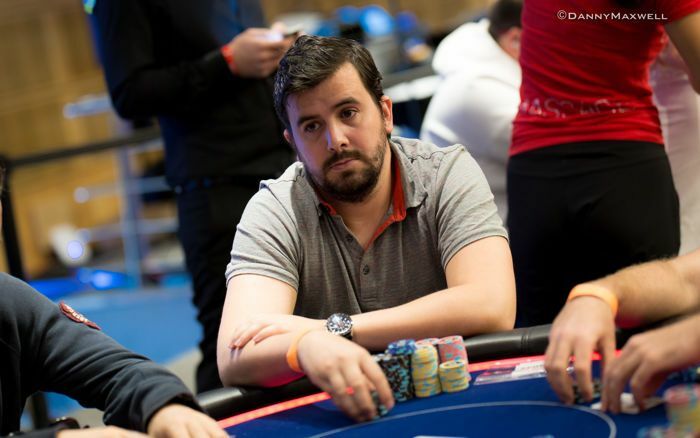 "NLZWERVERNL" won the biggest pot of the week in terms of big blinds in a hand at a $25/$50 no-limit hold'em table that involved both "Armada13" and Ignat "0human0" Liviu. 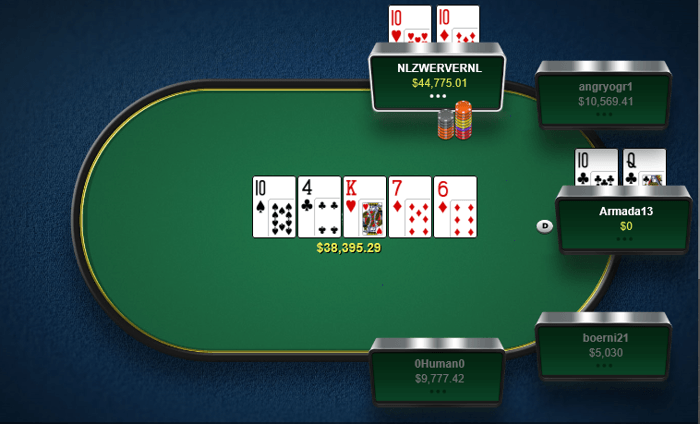 The action began with five players in the hand with "NLZWERVERNL" raising from under the gun for $125. "Armada13" called from the button before Liviu raised to $778 from the big blind. Both players called, and the flop came . Liviu continued for $889 and got calls from both his opponents. Liviu checked after the appeared on the turn before "NLZWERVERNL" led out for $2,436. "Armada13" called, and Liviu opted to fold. "NLZWERVERNL" led out for $7,461 after the completed the board on the river. "Armada13" jammed for $14,198 and "NLZWERVERNL" had his opponent covered and called. "NLZWERVERNL" shipped a huge pot of $38,345 or 767 big blinds after he showed for a set which was more than good to beat the second pair held by "Armada13" with . 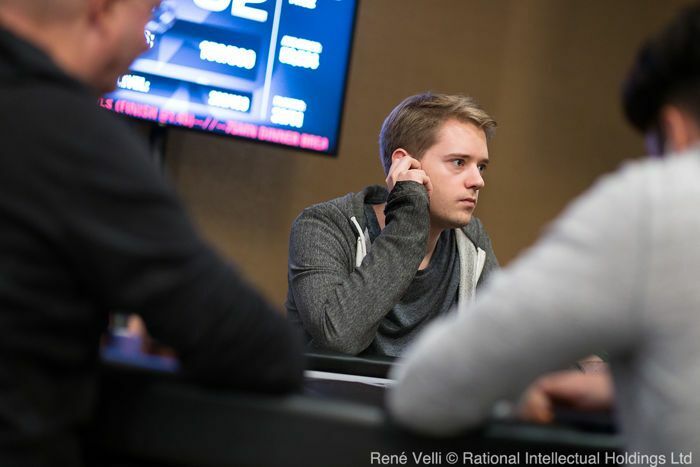 After winning $30,794 this week, Linus "LLinusLLove" Loeliger extended his lead on the 2018 leaderboard with $730,767 in profit. This is more than the combined profits of James "JayP-AA" Park (second - $316,630) and Alexander "joiso" Kostritsyn (third - $291,585), who both didn't play a hand this week. As has been the trend in recent weeks, "ImagineKing" padded his losses again on low volume to remain in the bottom spot on the leaderboard. Viktor "Isildur1" Blom remained in second to last while Jonas "OtB_RedBaron" Mols lost enough at the tables last week to propel him into the third to last spot past Elior "Crazy Elior" Sion who sat on the sidelines the entire week.